Martin said: "This is a fundamentally new way of approaching the material. Through these materials, we can envisage a carbon-free energy production process for clean fuels, wastewater purification and remediation." Titanium dioxide and Other "metal" oxides can significantly increase the absorption of visible light and promote the efficient utilization of solar energy spectrum in energy facilities. With condensed physics, semiconductor device engineering, and photochemistry, Martin's team developed a high-performance solar photocatalyst that combines the two materials. According to Martin, the main obstacle to limiting the performance of oxide-based photovoltaic or photocatalytic systems is poor visible light absorption of wide bandgap materials. Oxide candidate materials suitable for these facilities should be anatase titanium dioxide. Due to its chemical stability, low cost, and non-toxic properties, this material is a widely studied photocatalyst. However, as the main body of dye-sensitized solar cells, the presence of light-absorbing fuel is the main cause of the insufficient absorption of visible light by the wide-bandgap material. The author of the paper, Sungki Lee, said: â€œAccording to our observations, the unusual electronic structure of SrRuO3 is also one of the reasons that caused the optical properties to be less than expected. However, by combining this material with titanium dioxide, we can increase the absorptivity of visible light. And photocatalyst activity." SrRuO3 has a strong visible light absorption. 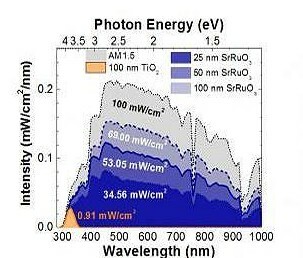 According to the above figure, the amount of visible light absorbed by SrRuO3 is 75 times that of TiO2. Driven by carrier injection, the structural, chemical and electronic compatibility of TiO2 and SrRuO3 can produce heterojunctions with photocatalytic reaction and enhanced photovoltaic activity. Lee added: "SrRuO3 is an electronic oxide that has metallic properties of temperature, interactive ferromagnetic cycling, and can be used as a conductive electrode in metal oxide heterostructures." Through light-induced carrier injection, the researchers combined SrRuO3 with TiO2 to create a new type of heterostructure. The novel structure has novel optical properties, and the photoelectrochemical properties can provide an interesting new way to promote the activity of photocatalysts and further increase the potential applications of other metal oxides. The study could provide a new way to challenge visible light sensitive materials and make a U.S. provisional patent application. The research work was mainly supported by the international organization of carbon neutral energy (I2CNER) research, the University of Kyushu, Japan, and the University of Illinois. Professor Petros Sofronis from the Department of Mechanical Science and Engineering at the University of Illinois said: "The I2CNER project brings together some of the world's leading energy researchers." "The successful research of the Martin Research Group shows that the I2CNER project is not just an international cooperation experiment. It also reflects the global consensus in pursuing green innovation, reducing CO2 emissions, promoting basic science, and developing environmentally sustainable energy technology solutions. Work hard."